*Variations exists with short cap tops, Emege versions, and versions with solid vs patterned cap tops which adds to the complexity and number of original variants. 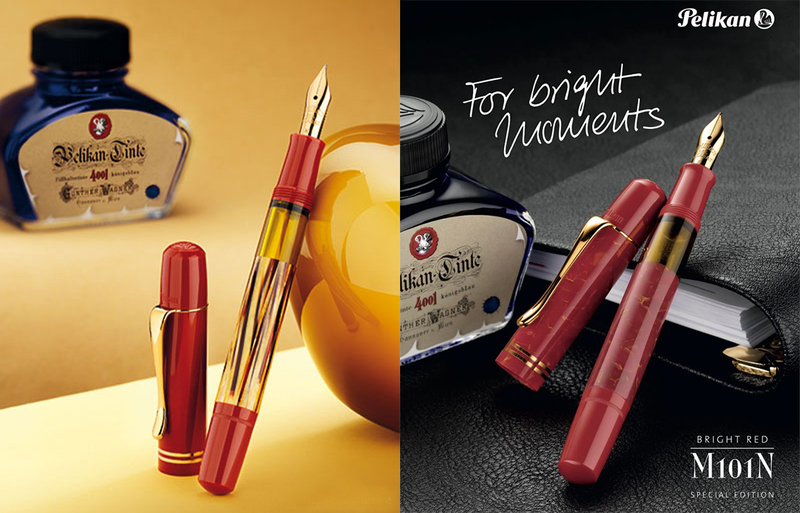 The photo appears to be a professional product shot in the style of many of Pelikan’s prior releases. What is interesting is that this pen appears to use the same nib, section, ink window, piston knob, and cap top as the last release in the series, the Tortoiseshell Red. If not an identical shade of red, the colors are not too far off from what we’ve already seen. What appears to have changed most is the material used to produce the cap and binde. In this instance, both are done in the same shade of red with what appear to be subtle, yellow-orange highlights that snake their way through the resin. Pelikan claims that these pieces are made of a high quality acrylic with a distinctive marbled pattern. The nib of this pen is likely to be made of a 14K monotone gold available in sizes EF, F, M, and B. The furniture is 24K gold-plated and the section, cap top, and piston knob are made from high quality resin. The ink window is an amber color. This would be a special edition release therefore when supplies run out, they would no longer be available. Previous releases have had an MSRP somewhere around $550. What are your thoughts on the potential M101N Bright Red? Is this one to add to the collection or something that you would want to pass over? Personally, I don’t mind the pen’s appearance but it looks and feels a bit uninspired. Perhaps it’s one of those that has to be seen to truly be appreciated. Putting the two side by side, I’d go with the Tortoiseshell Red every time. UPDATE 1/27/16: Vendors have confirmed this pen’s release en mass today. The anticipated release date is March 2017. Pre-orders should be available anytime now. Official pricing has yet to be announced. The orange provides something different but that catches the eye in a different way. I very much like the orange marbled appearance as well and can’t wait to see one of these in person. I’m a bit skeptical from the available photo so I’ll withhold passing any judgement for now. That’s a nice pen with a great heritage. Sorry to hear that the cap is broken but it’s still a great piece. Nice and vibrant colour . I agree with your sentiments about pricing and there has been no word of that yet. If there is any significant increase over prior MSRP, it might just be enough to push me to skip this one. I feel a bit cheated somehow that much of it seems the same as the previous Red Tortoiseshell, but I suspect the cap and binde material will be rather nice and I’ll get this one. The Lizard was really nice quality, the RT less so – hope this one doesn’t disappoint. I had a similar reaction when I first saw the picture. These releases seem to get more unattractive as they go along. The tortoiseshell brown was very nice, and looked very much like the vintage model. Ditto for the lizard, although I much preferred the limited version. The tortoiseshell red didn’t look like tortoiseshell, and this new pen doesn’t look like anything. I like the vintage form factor of this pen, but the color looks cheap. It’s not something I’ll be pursuing. I’ve noticed that a well-known dealer has been advertising the red tortoise at a discount for a couple of years now, and he still can’t sell them. Only time will tell if this will be successful but I agree that this is a bet of a departure from past releases. We’ll have to see how the faithful respond to it. I’d tend to agree, I’d like to see it in person first but right now it just isn’t lighting a fire in my wallet… there are other earlier pens to be had in that price range that would fit my collection better. By the way, thanks for the heads up Joshua! Love new announcements and the time you devote to telling us, even when the pen isn’t “love at first sight”. Interesting variety of opinions! I actually think this looks very pretty and will probably get it, but I like red. The nib is surprising “plain” at that price point. It’s not my style – by as they say YMMV. The nibs are plain but that is by design. These are meant to emulate the original pens of the 30s and 40s which were not heavily embellished. Well that is a surprise, I don’t get the sense from monitoring customer and collector comments around the interweb that they are responding to some groundswell of consumer demand. But I’m just one data point and probably not even on the chart much less close to the curve. A good looking pen but not so much that I’ll be buying one. I think they missed the mark by not fabricating the cap and section out of the same material as the binde. As is, it looks like a production run to use up ‘spare parts’, sort of an afterthought. I do wonder how they go about making these marketing decisions? My first impression was the very same as what you mention; “a production run to use up ‘spare parts. '” A little too needlessly similar to the prior release. It’s a very understated design, I think, but feels very Chinese New Year-inspired. I really quite like it. The red swirls – depending on the depth – would hopefully be similar to the swirly resins in the Cities series! These product shots make it hard to accurately judge the beauty or lack thereof in some of these models. Can’t wait for some real world pics to really be able to make an honest assessment. Hi Joshua, Any ideas on how does one preorder? Most of the vendors will be open to preorders soon. Pricing has yet to be comfirmed but is being estimated at something around €475 from overseas vendors. Just contact you’re preferred vendor to discuss preorder arrangements. Iguana Sell is taking pre-orders for March delivery. If it was more orangey-coral I would be more interested. I seem to remember the pink M600 didn’t look all that interesting from the initial pictures, but was actually rather nicer in the flesh. Still, it hasn’t got me excited. I had the same impression of the M600 Pink that you describe. I don’t mind the pattern/color of the M101N but just don’t see it fitting well on this pen. I wouldn’t mind seeing it on an M800 though. I’m trying to keep an open mind until we can see some real world pictures. ¿Alguna muestra de la tinta? No samples that I’m aware of as of yet. I received my M101N bright red today. I do like the design, but not as much as the two previous tortoise versions. However, that is just a matter of personal taste. My reasons for buying it are partially because I have the others as well. Now that it is here, I am a bit disappointed. The cap is a bright red with very nice swirls in it. It does have a sublime appearance. You could say it has just the right amount of brightness to gleam, but at the same time not being loud. That’s the cap. The sleeve, however, is noticeably darker. It does take away a lot. I am thinking of sending it in so that they can find me either a matching sleeve or cap. Don’t get me wrong. It is a wonderful pen but at that price tag I do expect the colors to match. What I like most about these pens is the 100N style of them. The special designs of course make them look like 101N. Again, a matter of personal taste. Another good thing about this series is that I can keep the original 101N in my work desk where it won’t get damaged or lost and using an M101N as everyday pen. I am currently having a thirties nib being fitted into a modern ink feed for use in the M101N. Speaking about the price: I paid a “mere” 319 Euros. I somehow believe these will not sell very well. The tortoise brown was well accepted, the M101N lizard can still be found new on ebay today now and then, The tortoise red seems not to have sold well. They are still being offered regularly on ebay and usually fetch between 220 and 270 Euros. I believe the bright red will sell for a similar price later on. I wonder about Pelikans intention of this series. They do not expect people to buy and collect these, right? I think these pens are meant to be used. In either case, I wish Pelikan would issue them in a simpler, smaller, more appropriate box. What do I need a cardboard drawer for? A pen belongs in the shirt pocket (or purse, or wherever it can be conveniently taken along – your not going to be lugging a cardboard box around). I imagine the average collector won’t value that drawer either., the wooden box of an M700 being more impressive. So, to sum it up: nice pen except I am a little unhappy about the distinctly different shades of sleeve and cap of mine. The old 100N shape and 101N like colors make all of the M101N spectacular pens The tortoise brown remains my favorite. Thanks for your insights. I’m still awaiting mine from Germany ($110 cheaper than the best US prices). Of all the M101Ns, this one has impressed me the least and that’s including the Lizard. I think its a bit underwhelming. I agree that the body and cap should match. To me, this looks like left over tortoiseshell red parts repurposed into a new run of pens. Overall, the look is uninspired and I think a lot of purchasers that I’ve talked to have stated purchasing this one simply because they own the other three. I fear I have to count myself amongst that company. I was hoping to be pleasantly surprised when it finally arrived but your impressions fit with my suspicions since the announcement. I tend to agree that we will see these on the market for some time to come. Perhaps the next release will have some more pizazz. Dr. Joshua – I see almost every Pelikan show up on Massdrop. Any idea why that is? A lot of Pelikans show up on Massdrop which I think speaks to the popularity of Pelikan in general. The drops are partly selected from user feedback and request. Unfortunately, Massdrop prices have rarely been a bargain in my experience. The asking price here of the M101N isn’t too bad. These were going for $450 on pre-order from certain vendors in the US and around $345 from some overseas retailers. The real world photos seem to make it appear a little more attractive than the official product photos did. Still, I think this is the least inspired of the m101n releases thus far. I think the other three (which I own) were really nice. What has disappointed people I think is that they are priced far above what collectors tend to think they should really be worth. Each one has gone up in price too. I completely agree with your sentiments about the real world photos and the lack of inspiration. A pretty pedestrian release and I’ll be curious how well it sells. I do think there is a bit of a built in market, particularly for those who have collected the other three. The previous three M101N models (tortoise brown, lizard, tortoise red) are based on historic variations of the 101N. 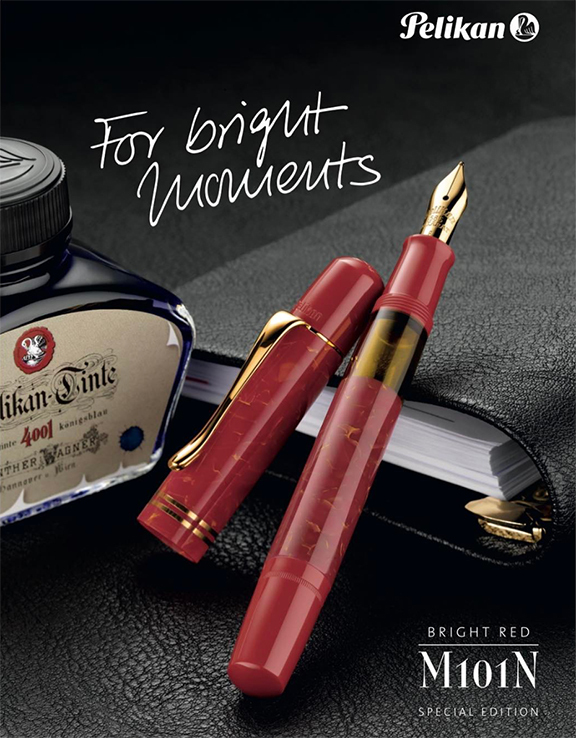 With the M101N bright red, Pelikan seems to have added a model without a historic counterpart. Possibly, there is a counterpart – well, sort of. Though there apparently was no 101N with the same design, the bright specs in the sleeve and cap do remind me of the coral 101 (not N). The cap end and knob of the coral 101 of course differ from the M101N bright red. Unfortunately, I do not have a coral 101 to compare to the bright red M101N. Maybe somebody else can do that and report. If the coral 101 actually is the archetype of the current M101N, then Pelikan might issue a granulated green (derived from the jade 101) and a swirly blue (lapis 101) in the near future. And if they do, I would also like to see a sparkling lemony yellow! I have seen the Coral 101 and it is a far prettier pen in my estimation than the M101N Bright Red. I am less optimistic that you would see a Jade or Lapis version as Pelikan has already been to that well with the Originals of their Time series. Of course, you never can tell what the company has up its sleeve. I have to say though, the bright red leaves me wanting for more. I own the first three pens in this series; and would agree with the prior observation that each release seems less attractive than the one before it.The brown/green tortoise has become a regular in the rotation, the others languish. And it appears Pelikan has upped the ante by $100… this lists at $650 according to FPH. Just wow. A pass until someone closes it out at deep discount. I concur that this release certainly is not a must have at the US price point. US MSRP is $650 so vendors are offering it at $520 with the standard 20% discount. You can get it for $150-200 cheaper overseas which is a little more palatable for what you’re getting. I’m going to eat my words on this one. I recently scored a ‘bright red’ from Germany for about $375 delivered new with the presentation box, ink and papers, which seemed fair enough. I like the pen quite a bit. The tortoise in brown and red versions still win on looks, lizard brings up the rear. But the bright red is an interesting look; the yellow veining is subtle and the overall appearance is elegantly understated. It reads more coral than cherry red as it shows in photos. Mine came with a very silky nib with perfect flow, and I will happily use it often. If only my considerably more expensive 1935 LE lapis had arrived with a nib this smooth and generous, I’d be a happier man. Glad to hear that the Bright Red was able to change your mind. The price you paid was very good indeed as far as these things go. Enjoy it!